Based in large part on Alice Bailey’s Treatise on Cosmic Fire. The devil’s in the details. Kronomyth 6.0: The cosmos is my Bailey wick, or Will the real Todd please stand up? Initiation is more or less inspired by occultist Alice Bailey’s Treatise on Cosmic Fire. (Todd would revisit the topic for Another Live’s “Seven Rays.”) I would tell you it’s one of his weirder efforts, but since I’ve felt that way about his last few albums, better to say that Todd was getting progressively weirder. Technically, this could have been another double album, but Todd or the labels or someone decided to cram over an hour’s worth of music onto two sides of plastic and then issue a warning at the bottom that all but conceded putting so much music on one elpee was a bad idea. Critics tend to focus on the second side of music: an instrumental cosmic buffet played entirely by Todd, much of it on synthesizers/computers, that sounds alternately like the cosmos being opened and a carousel being burned down. I would not recommend listening to it high, since it might very well scare the hell out of you, or into you, depending on how you see these things. Those listeners less inclined to take a thirty-minute head trip with Todd will enjoy the first side of music infinitely more. “Real Man” is one of his best ballads, although on closer inspection you’ll find the song isn’t about love, but love of self. The same goes for “Fair Warning,” in which Todd makes plain that his first loyalties lie with his muse. Then there are the usual clever digs at the music industry (“The Death of Rock and Roll”), a humorous wrestling with religion (“Eastern Intrigue”), a singularly strange incantation (“Born to Synthesize”) and the big number that ties it all together (“Initiation”). At this stage in his career, Rundgren didn’t have to prove anything to anyone. He was making the music he felt guided to make, and there are many who will be up for a journey like this with Todd as their spirit-guide. I’m in the middle on this one, but we’ve already established what a musical milquetoast I am. The timid among us will enjoy the first half of the trip, while the adventurous will be only too ready to embark on Todd’s sonic/psychic journey. Maybe he should have called this album Faithful and his next Initiation, since this is best left for the faithful while the other is a better starting point for initiates in Rundgren’s musical world. 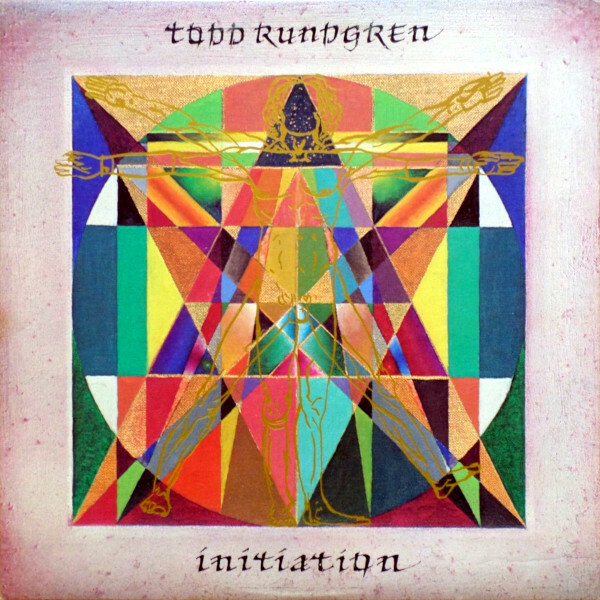 Todd Rundgren (vocals, piano, string ensemble, keyboard computer, synthesizer, guitars, percussion, electric sitar, clavinet, all instruments on side 2) with Barbara Burton (percussion on A4), Rick Derringer (bass on A3, guitar on B6), Kevin Ellman (drums on A1/A3), Dan Hartman (bass on A6), Moogy Klingman (keyboard computer on A1, organ on B6), Barry Lazarowitz (drums on A6), Roy Markowitz (drums on A4), Rick Marotta (drums on A5), John Miller (bass on A4), Chris Parker (drums on A6), Lee Pastora (congas and bongos on A4/A5), Roger Powell (synthesizer solo on A5, creative assistance on B1), Bernard Purdie (drums on A5), Bob Rose (rhythm guitar on A5), Dave Sanborn (saxophone solo on A5), Ralph Shuckett (clavinet on A1/A3), John Siegler (bass on A1/A5), John Wilcox (drums on A3), Edgar Winter (saxophone on B6). Produced, arranged, engineered and mixed by Todd Rundgren; engineered by Jack Malken (A3, A4-A6). Cover art by Todd Rundgren. Lettering by Hal Fiedler. Released on elpee on May 23, 1975 in the US (Bearsville, BR 6957) and the UK (Bearsville, K 55504); reached #86 on the US charts. Re-released on remastered compact disc in 1988 in Japan (Bearsville, VDP-28019). Re-packaged with Faithful on 2-for-1 2CD in 1988 in France (Castle, TFO 16 1/2). Re-issued on compact disc and cassette in 1993 in the US (Bearsville/Rhino, RNC 70866). Re-issued on remastered compact disc in 1999 in the UK (Essential, ESM CD 701). Re-released on K2 remastered compact disc on June 16, 2006 in Japan (Bearsville, VICP-63454). Re-issued on K2 remastered compact disc on June 25, 2008 in Japan (Bearsville, VICP-64208). Re-released on super high material compact disc on March 18, 2009 in Japan (Bearsville, VICP-70063). Re-packaged with Faithful on 2-for-1 2CD in 2011 in Europe (Edsel). Re-issued on compact disc on December 10, 2014 in Japan (Bearsville/Rhino, WPCR-80177). No matter what the critics say, I enjoy this album a great deal. I got a vinyl copy in 2011 and when I listened to it, I laughed all the way through.